Many people understand the advantages of using food as a reward in training dogs, but play is also a very powerful reward. Studies have found that, for dogs, social interactions with familiar humans are highly rewarding and that dogs whose owners play with them have been found to score higher in obedience tests than those whose owners do not play with them (Bradshaw, Pullen, & Rooney, 2015). To get the most out of play, keep everything positive. The benefits of play are reduced if the dog receives a verbal correction from the owner and dogs who have been trained with punishment-based methods are much less interactive during play than dogs who are trained with rewards (Bradshaw, Pullen, & Rooney, 2015). Initiating play with many dogs is easy. Studies on play between dogs and humans showed that when humans run toward or away from a dog, the human was effective at initiating play with their dog but when humans tapped the floor in a common method of attempting to initiate play, the dogs showed a much lower rate of responding playfully to the human behavior (Rooney, Bradshaw, & Robinson, 2001). A good game to play with a dog is tug toy. For many years this was not recommended but is actually a great game to teach rules of play, to build confidence in the dog, to reduce anxiety and as a great reward for other less engaging exercises. Teaching “tug-of-war” correctly is important and consists of several steps. Tug toy should be taught and played with rules in place, much like human games are. The rules should be trained and include that the dog must relinquish the item when asked; that there is a special tug toy for this game and that the game is initiated on cue (and the dog must not grab before the cue to start is given; the game should be interrupted by other exercises like obedience and a game restart as the reward; and that the dog can never place his teeth on human skin. (San Francisco SPCA, 2016). 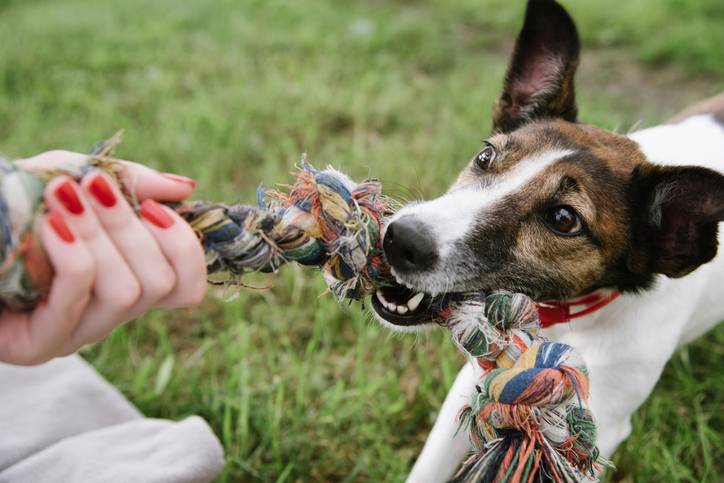 The other benefit to playing games with your dog is that studies have shown a correlation between lowered rates of separation-related behavior such as vocalizing in the absence of the owner or staying by the door the owner left by and playing games with physical contact between dogs and owners and playing games with physical contact between dogs and owners (Rooney & Bradshaw, 2003). Play is rewarding because it is fun for the participants. In studies of rats, neurobiologist JaakPanksepp discovered that an increase in opiates facilitates playfulness and opiates may enhance the pleasure and rewards associated with playing. Play is a cooperative pastime and MRIs (magnetic resonance imaging) on humans show that the brain’s pleasure centers are activated when people cooperate with one another (Bekoff, 2007). Studies at Colorado State University revealed that oxytocin levels in women increased by 58 percent when women played with their dog (Hare & Woods, 2013). Oxytocin is an important hormone for women promoting mother-child bonding amongst other functions and has been referred to as the “cuddle” hormone.